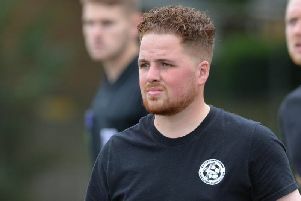 Lutterworth Athletic’s Callum Wills could be out for the rest of the season after dislocating his shoulder. He suffered the injury while winning a penalty for his side in the UCL Division One match at Burton Park Wanderers last weekend. The kick was converted and set them on their way to a 2-1 win but Wills paid the price for being felled. “He’s done it before a couple of times and had it operated on which is why the advice is he shouldn’t play again this season,” Athletic boss Mike English explained. “Normally with these it’s four weeks or so out and then you start to get back into things. As for the performance at Burton, English was not hugely impressed. He added: “We struggled to be honest. They are quite an average side and we dropped to the level. “Things are not the best there and they are desperately fighting to keep things going. “But we weren’t very good. “It was almost identical to the home game when we left it to the last minute to beat them. Athletic were due to play Whittlesey this weekend but they have withdrawn from the league. The reserves are in action against Oadby in the County Cup.